Regardless of whether you are new to using graphical mapping techniques; the value of Mind mapping at the base level, is an excellent personal development tool for creating, managing and expressing your thought processes. While your at the stage of discovering the real power of Mind mapping, you may eventually become aware of the power of an expanded scope of the tools you use. This expanded scope may be the vehicle that transports you from mere Mind mapping into an expanded visual freedom that is more expressive within Visual mapping (multiple graphical formats). Visual mapping while including Mind mapping, allows you to be more expressive while mapping out information, enabling the creation of knowledge maps that can, and in many cases, are so beneficial to your personal, academic and business environments. In many cases your Mind maps are so personal, they may be rather misunderstood by many who view them. Mind maps tend to be within this personal category, and IMO many who share their personal maps should have thought twice about doing so. Clarity may be the "AHA" moment for you at the personal use level, yet when you become more proficient at mapping out your information and knowledge within an academic and business level; it becomes more convenient and even necessary to share your maps with your students, colleagues and clients. This is where the advantage of Visual mapping has been experienced for me. A number of years ago, I experimented with printing many of my mapped information off as poster formats. I initially wanted to see if they resonated with me, they certainly did, so I then shared this large printed format with a few colleagues. The results were quite impressive; they actually asked me if I would make one available for them. At that time it seemed I had stumbled upon a way to make mapped formats become more exposed and acceptable. I also trialed this format with a few of my clients too, and the response was very encouraging. I found that the over sized prints were becoming an "in demand" format, and also found my mapping skills were becoming more known and I therefore realized this format could become a business service. What was really interesting regarding the poster sized prints: I noted an interesting observation while I was trialing them within a few client locations. I either laminated the prints for preservation or had a plaque made for presentation purposes. Regardless of the presentation (poster or plaque); I noted that many students and employees made a habit of gathering around these formats and engaging in discussion and debate relating to the content. I jokingly remember; when I hung a graphic on the wall in a dinning area of a clients location, I noticed the dining tables began to be moved towards the maps, and interesting conversations relating to the content were regular. So it was very clear this format of printing and display was something that may be useful to my clients, and this therefore became a part of my service offerings from that point onwards. I encourage you to investigate creating relevant knowledge maps for use within your academic and business environments. The monetary opportunities for you may be similar to what I experienced some years ago. In my experience though; Mindjet MindManager is by far the most effective information mapping product; it deals with the insertion and management of attachments and images with absolute ease. All other developers lag behind this corporate leader. BPM or Business Process Management is a hot topic these days and rightly so. However the effectiveness and profitability of the business depends, in the first instance, on the effectiveness and efficiency of the individual employees. It is therefore suggested that in addition to any formal organizational BPM initiatives a personal version, for individuals and small groups should be implemented. This process will be known as P – BPM or "Personal Business Process Management". Why P-BPM as against BPM? Enterprise level BPN implementations frequently include high-end tools such as Microsoft Project, Primavera or Oracle’s JD Edwards. While these applications are excellent at an enterprise-level they frequently do little for the individual manager. This is evidenced by the evolution of such applications as Project Kickstart™ which was developed in the 90s by disappointed Microsoft Project users; who found MS Project too complicated to setup, particularly for small projects. The message was clear: the vast majority of processes and projects managed by the average manager are far too small to use such "heavy" applications yet are important enough to be managed using best practice. If a project is large or grows beyond a small departmental project, it can be migrated to an enterprise solution. Even with an informal, low key project, a good manager would follow those outline steps instinctively. However when job pressures increase it is all too easy to accidentally miss out on one of the steps. The evidence for this is quite clear in aviation as one of the most common causes of accidents or near accidents in light aircraft is landing with the undercarriage retracted. This can only happen when the pilot neglects to use a well-known in standard checklist which includes "handbrake off" and "undercarriage down and locked". This checklist should be done automatically even when using a fixed undercarriage aircraft … In other words using the full checklist, regardless, ensures that nothing vital is missed. It is therefore suggested that if an easily used system with clear processes, instructions and templates is established, errors are likely to be considerably reduced. This has the effect of maintaining quality and efficiency. Amanda is an engineering graduate with seven years’ experience in various aspects quality control and quality improvement. She runs the quality department in an oil company and has staff of 10. Being an engineer she is, by nature, a disciplined individual and the last thing she does every night is to prepare a to-do-list for the following day. Currently her department has seven ongoing projects which need careful supervision and she is also in the middle of annual staff reviews. She looks at her to-do-list and her computer based diary [which her secretary keeps up-to-date] and realizes that in addition to reviewing the ongoing projects, she also has to attend two meetings today; one concerned with the kickoff another new, but small, project. What will be Amanda's major challenges today? 1. The first consideration is that she has to keep quite a few "balls in the air" at the same time. Research has proven that it is impossible to deal accurately with more than four issues at any one time. This being the case there is a high probability that Amanda will either miss something or take a decision which is less than optimal. 2. One of the meetings today is to report on the current status of four of the seven projects. She needs to rapidly generate interim reports for these projects. 3. Amanda also needs to go over the handwritten records she keeps on various staff members to prepare for the reviews. 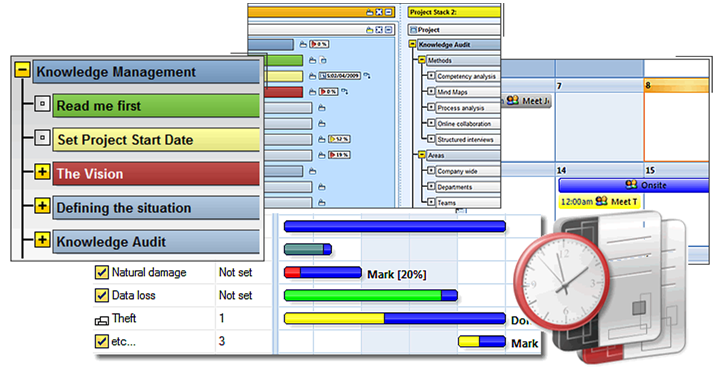 · There is a high probability that she has not used the main project management system for some of the small projects. This would happen for two reasons: firstly these systems are notoriously difficult to setup, and secondly the perception is that the result is not worth the initial effort. It should be remembered that Amanda is a skilled engineer and manager, not a professional Project Manager. · For the previous reason, generating progress notes on the projects that require reporting today are going to be extremely time-consuming. · When discussing the new VSP in one of the scheduled meetings the main systems will be of little value in capturing the initial requirements for the project. · Enterprise systems are not really suitable for the sort of notes which Amanda keeps to help her with staff reviews. If Amanda had a P-BPM [Personal Business Process Management] system and a PKM [Personal Knowledge Management] system in place is highly likely that she would not only be more efficient, but in reality her workload also reduced during the day described. 4. By way of templates; having access to optimum procedures for a wide range of tasks. 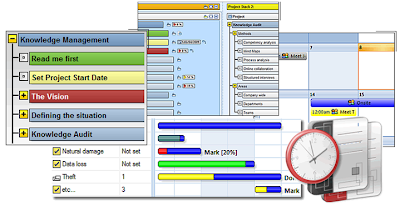 This is based on standard System Templates (over 50), Customized Organizational Templates and User-defined Templates. 7. To easily define new procedures and work-flows in a logical manner. Mindsystems Amode® provides a total process and information management environment designed to make the individual manager more efficient, organized and productive. All of this is achieved at low cost without conflicting with established enterprise systems. Business is extremely process oriented, and in fact, relies heavily on procedural instructions that support specific processes. And these processes drive the respective business management system (BMS). A BMS may or may not be accredited by a registrar associated with the International Organization for Standardization (ISO). BTW using the standard or accomplishing a high level of achievement is certainly not associated with or reliant upon adopting the ISO standard at all IMO. When you approach anyone within a business organization (for the most part) they will answer the question; why do you do the things you do here? With; Oh It’s just the way we’ve always done things. OK; I’ve made an extreme case here. I haven’t come across too many businesses that use standardized business management system requirements such as ISO 9001, which haven’t made their employees aware, of the basic requirements of understanding procedure, process and system. But Wallace; you’re a Visual mapper, what’s all this got to do with procedures, processes and business management systems? 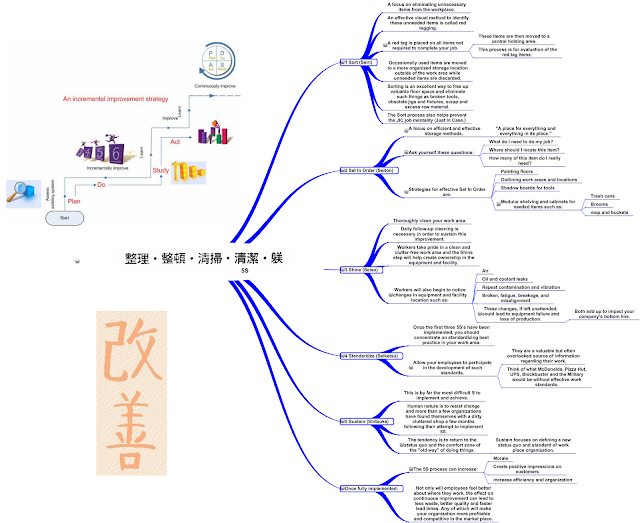 Much I say; and here’s a case for using mind-visual and knowledge mapping within your BMS. The interesting point is; you’re already visually mapping out information with the use of flow charts, graphical reporting relating to statistical process control, six sigma and value stream mapping. In my experience; the missing tool that would exponentially enhance your information management skills is Mind mapping. Now I do understand that if you’re already using graphical information management tools at this time; why would you consider using Mind mapping too? This is a question that must be answered in order to justify adopting another tool into your business operations. You’ll notice I have used a three pronged approach to mapping in paragraph five of this article. This is significant, as Mind mapping is merely a first step to experiencing the exponential growth of gaining more control over all aspects of your BMS using graphical information management tools. Imagine having a single point of access to all of the procedures, processes, documents, policies and protocols of your whole BMS, at hand within a systematic framework. This framework has its genesis in the use of Mind mapping. Almost everyone I introduce to the power of graphical thinking through the tools techniques and mindset of what I call visual mapping, are changed in a very positive way. Master maps; remember this term as it’s going to be rather important to your future use of mind mapping within your BMS. While a BMS is linear in operation, especially when manufacturing is the arena; the system that is supported by the respective procedures and processes is in many cases non linear. In reality a BMS may be likened to a planetary system; the sun may be the system sustainer and the planets may be likened to the processes, and in turn the moons may be likened to the procedures. The point I wish to make here is one of reliance. Just as with planetary systems; it may be said that a BMS may be somewhat of a microcosm of this example. Another point to keep in mind; many successful business systems managed and improved by knowledgeable staff, express an understanding of process in relation to systems. I have come across many knowledge workers within these successful organizations who handle procedure and process with effectiveness, to the point of, expressing an understanding and practice of systematic thinking. What is the starting point for many organizations that adopt mind mapping into their existing business processes for managing data, information and knowledge,? The scream for help is usually the cry at the start, or for some it may be a logical acceptance of the reality of a need for a more effective system of organization. Visualmapper is here to assist, teach and coach you through the process of understanding the procedures at the base level, and viewing your system at a higher level. While tools are important; the methodologies and more importantly Mindset is what drives this journey. At Visualmapper, we believe in the independence yet interdependence of all of the activities wrapped up in your BMS. This acknowledgement will come to you in a more coherent view, once you understand the importance of bringing all of your operational processes into a systematic framework for business efficacy in and through Mind mapping. If at all you are considering integrating Mind-Visual mapping into your BMS; feel free to access a free eBook and associated work here; it's a few years old now, but I do believe it has relevancy as a more rounded introduction to your integration of the tools, methods and Mindset of Mind-Visual mapping.